Taking our time in testing products, so you wont have to waste your time in the field. X-Ring Archery introduced its Sika-Flex bow stabilizer and wanted to know if western hunters would like it. After putting the new offering through its paces, we have to answer, Yes! The new stabilizer offers two rubber-coated models in 5" @ 9.8 ounces, or 7" @ 11 ounces. The rubber finish comes in basic black, or one of three camouflage patterns; Mossy Oak Breakup, Realtree Xtra Grey, and Advantage. The unique rubberized connection plug grabs the riser firmly, while providing a first line of vibration dampening. The Sika Gel inside the stabilizer controls the rest of the vibration like spandex on a cheerleader. The gel is advertised to remain pliable from 40 to +140 degrees. Westernhunter was not able to verify these claims (for obvious reasons), however, I did find the stabilizer to remain effective from temperatures at freezing, to just over 100 degrees. The Sika flex stabilizer was tested on an extremely radical, solo-cam bow. The results were obvious and instantaneous. Riser feel smoothed. Bow noise decreased. And most importantly, group size on target was significantly reduced. So, if you are having problems taming your "beast", you may wish to try a Sika-Flex by visiting your local archery shop or by contacting X-Ring Archery at (859) 623-3660 or on-line at www.x-ringarchery.com. Scent makes No Scents! When Robinson Laboratories, Inc. Scent Blocker products introduced Carbon Blast during the SHOT Show this year, its video presentation had all of New Orleans buzzing. When you can see a six-point bull elk standing over a hunter (his chest actually touching the archers shoulder) without smelling him, and then watch as the bull calmly walks out to ten yards and is shot, its impressive! This activated carbon product is an offshoot of Scent Blockers clothing line, which has utilized the same substance within a special fabric layer to effectively minimize the spread of the human scent halo. The new Carbon Blast is a microporous carbon dust, suspended in an aqueous solution designed to be sprayed on any clothing or nonporous material to help eliminate odor emitted by the hunter. (It is not to be applied to skin.) Although WesternHunter.com does not have a lab full of sophisticated equipment to measure odor samples, we did have the worst case scenario; a cat box! A few quick sprays and a couple of minutes of evaporation, and the rank smell was nonexistent. This was almost as impressive as the SHOT Show video presentation. We found the carbon settles to the bottom of the container, and Carbon Blast should be thoroughly shaken prior to, and during application. The entire garment is to be sprayed and extra application should be given to armpit and crotch areas, hat, boots and gloves as these areas produce the most human scent. Although carbon is black, we noticed very little difference when it was sprayed onto camouflage fabric. When sprayed on white cloth, the carbon was very apparent, but came out in the wash. However, on Snow-camo the darkening was of no consequence. Carbon Blast is available in 16- and 32-ounce spray bottles at your local sporting goods dealers or at www.robinsonlabs.com. Hunting boots by Danner Shoe Company have once again hit a new mark. 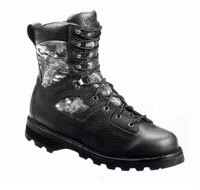 With the introduction of their High Country Camo boot, Danner will make many hunters feet very happy. The leather and Mossy Oak camouflage fabric mid-weight boots are lined with a choice of 400, 800 or 1000 grams of Thinsulate Ultra insulation. The outsole is Danners Littlehorn style that has large perimeter lugs for great stability, and interior bobs for excellent traction on loose or slick surfaces. The 8-inch boot is Gore-Tex lined to keep your feet dry when your hunting isnt! I found these boots to be very sturdy, yet with a fairly rapid break-in time. Although the 400-gram model is warm enough for those mid-season archery hunts where inclement weather is a real possibility in "high country" they also provide all the comfort a long sit on a stand or in a tree begs for. Testing in the heat of summer was comfortable and no problem. These boots provide a good balance for early to mid-season and more! This boot has quick-lace studs that wont bend open or be smashed closed by rough treatment. Two of the most annoying things to do in camp are trying to figure out how to tie your boots when a quick-lace has broken off, or worse yet, having to spend that last bit of energy after a long day hunting, trying to pry your boot lace out of a smashed loop! The boots stay snug and secure at the ankle due to a double layer of leather that holds you firmly in the footbed for daylong hunts without sore feet. High Country Camo boots by Danner are a good-looking boot built for rugged use. The only hard part for me is how to explain to my old Danners, which have served me for a generation, that they have become my back-up pair. For more information contact Danner Shoe Company at www.danner.com. Copyright © 2001 J & D Outdoor Communications. All rights reserved.